It’s been a fantastic 365 days for one Northwest lake. 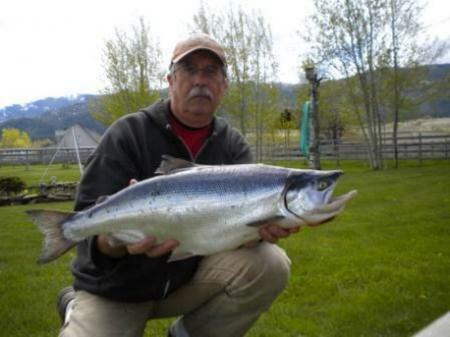 It was exactly one year ago that the first of five new record kokanee were caught at Wallowa Lake, in Northeast Oregon. By our calendar, it’s been five weeks since the last time the Oregon record book and its well-used eraser was hauled out. The run started off with Jerry Logosz, a former Joseph shopowner who’d retired to Arizona but comes back for the fishing. His 7.085-pound landlocked sockeye was just over a quarter pound heavier than the standing record, held for seven and a half years by Pam Fahey, and which blasted the previous high mark by a full pound. While nothing topped Jerry’s fish the rest of the summer, it was pretty clear something was going on with the lake’s kokes. By late August, guide Mark Moncrief had caught at least 152 20-plus-inchers, twice as many as he ever had. Five years ago also saw a spate of long kokes, says Snook. The local biologist pointed to the lake’s mysis shrimp as well as low numbers of the salmon. While the daylight-feeding fish and darkness-loving shrimp really miss each other, some of the former are specifically targeting the latter. It took four hours and a lot of experimenting with various lures, but with each and every nibble, the school of kokanee was evident. With patience, in 100 feet of water and about 15 feet from the bottom, Gene caught his first kokanee of the season. After all the other fishermen had left the lake, there remained a solitary canoe drifting in the water. A light drizzle and the approaching rain clouds did not deter Thiel in his quest. It went just over 71/2 pounds. A month later, Wan Teece of Enterprise was trolling at midlake when a fish nearly 12 ounces heavier bit. Not only did it break Thiel’s mark, but was soon declared the largest ever caught in the United States. And with fish breaking previous marks in giant half- and three-quarter-pound bites, the world record, 9 pounds, 6 ounces, soon appeared in sight. So was the ramp for Bob Both of Lostine. He and a friend were just about to give up that windy day in early May when his 8.85-pounder latched on and went crazy. When he hooked the record-breaking salmon, Both said the fish did four aerials, jumping completely out of the water and dragging all of the flashers. “I knew I had a special fish,” Both told the La Grande Observer. Then with the turn of the calender page, it was another person’s turn for the limelight. Enter Ron Campbell, a private fire investigator from Pendleton. His koke not only demolished the state record by another three quarters of a pound, but at 9.67 pounds is the pending world record. “This one here, it tore me up. Pound for pound on light tackle, that was a thrill … That was a handful,” he told Northwest Sportsman. 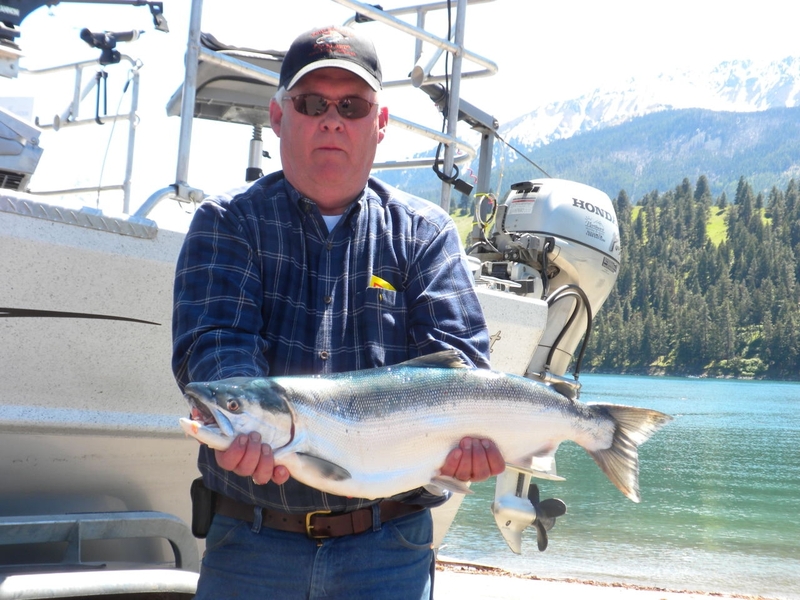 Interestingly, Campbell’s brother, Larry, of Cove, Ore., previously owned the state record for kokanee with a 5.19-pounder caught at Wallowa back in 2000. Both bros were on the water yesterday too. Almost like clockwork, after each new record is announced, Snook’s phone starts ringing with calls from California, Montana and Idaho anglers eager to learn more about the lake and its fish. Some koke fiends have been coming from even further afield. 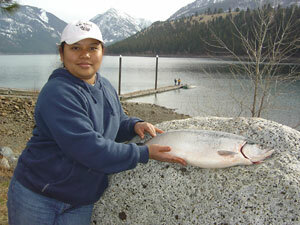 On her Web site, she pins the next record fish at precisely 10.3 pounds — a double-digit kokanee. Then she says she needs to run a credit card for a customer. Kokanee business has slowed down since the start of her season, Barstad admitted before hanging up, and Snook notes that there a lot of other things to do in this corner of Oregon that lacks grand shopping malls and water parks. “We’ve got natural things to do,” he says — hiking, biking, river rafting, mountain climbing. What’s become natural for the locals to do is break state, national and now world records at Wallowa Lake. But whether another one falls is a good question. Rising water temps move the fish towards the center of the lake in midsummer where smaller kokanee snap at offerings faster than the big boys, and then next month the urge to spawn hits. “You can still catch fish in August, but a lot are moving to the river and staging. They get a hump and start to lose weight,” Knox says. Will one of the bankies who gather around the inlet be the next record wrecker? Knox didn’t seem to think so. And after next month, the fish will be able to pass on their genes in peace as the Wallowa River closes. As far as fishing on the lake, he says nice ones to 4 pounds are still being caught. And he has good news for anglers who like to catch lots of kokes. Smaller ones have begun showing up in the catch, a sign of a larger year-class behind the current one. But this is one year-class that will not be forgotten for some time, in Wallowa County and beyond. This entry was posted on July 19, 2010 at 9:40 pm and is filed under EDITOR'S BLOG. You can follow any responses to this entry through the RSS 2.0 feed. You can leave a response, or trackback from your own site.